So you’ve done your homework and learned about the immense benefits of government contracting. Uncle Sam is a customer who has billions to spend every year, is always looking to buy, and he will spend more in recessions. Plus, there are exclusive opportunities just for small businesses. Naturally, you’re going to want a piece of that pie and get registered in the System for Award Management (SAM). Looking online, you find a variety of third-party companies who handle SAM registrations. After all, who wants to handle tedious government paperwork and risk fines for errors? Things look pretty uniform across the board. How different could it be to have your SAM registration handled by one company vs. another? It could actually be quite different. This decision will determine where you take your business in the next five, ten, or even twenty years. Some firms just want to get you registered and then it’s onto the next. 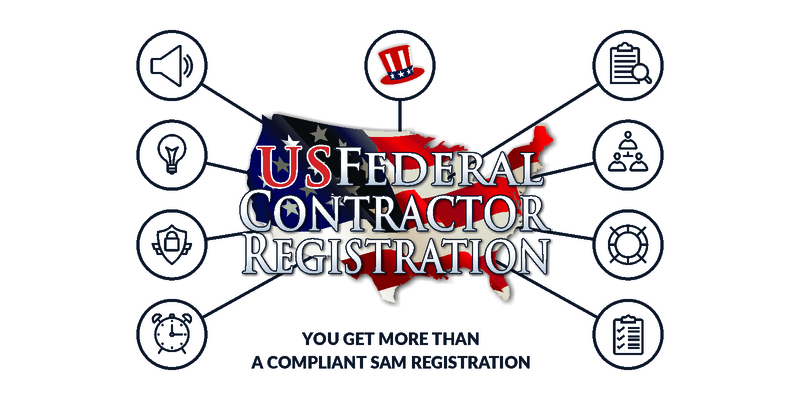 US Federal Contractor Registration wants to get you registered and actually help you win contracts. Our SAM registration service is our most basic package, but it’s everything besides basic. New policies in SAM can affect your payments. Case Managers track these policies and proactively make sure you’re compliant. Support from the Federal Service Desk can leave you on hold for hours. Government contracting is hardly static. New regulations and policies are always being put into action. It’s not often, but once in a while it could feel like they’re pulling the rug from under you. Just ask anyone who hit a brick wall when the notarized letter policy was enacted in 2018. That caused a 74% drop in new SAM.gov registrations. During this period, USFCR clients had Case Managers helping them around the clock. Everyone else was left to call the Federal Service Desk and be put on hold for several hours at a time. We were around before SAM.gov was even implemented, and we’ll be here after the next system is implemented. We’ve got the track record and the “war stories.” Let us worry about the changes. You’ve got a business to run and contracts to win. FedBizOpps, FPDS, and other gov’t websites are outdated. The Advanced Procurement Portal simplifies your contract search. Only USFCR clients have access to APP. Things are always changing in government contracting…some changes are not immediate. Case and point? FedBizOpps, FPDS, and basically any other government website. These sites are just plain outdated, clunky, and they’re anything but user friendly. You need to be out there submitting offers and getting a leg up on your competition. You don’t need to be fumbling around with old and confusing websites. That’s why we made the Advanced Procurement Portal (APP). You get opportunity search, market research, and plenty of other useful features in one place. If you’re able to log onto Facebook or search with Google, you can use APP. It’s that easy. Plus, you will be able to set-up notifications right to your email when a relevant opportunity gets posted. What other firm offers to get you registered in SAM and then makes it 10x easier for you to find contracts? Information on government contracting is scattered and disjointed. Our Learning Center has everything you need to know in one place. The modules are designed for contractors across all skill levels. The best tool a contractor has is between their ears. Sharpen it and become a government contracting expert with our Learning Center. Before, you had to dig through various websites or even through Federal Acquisition Regulation (hardly a page-turner). Even with those resources, it’s difficult to know what, out of this pile of information, is actually useful to you as a government contractor. You will never have to go through that hassle. We’ve done it for you. If you’re a complete novice you can learn everything from A-Z in just several videos. For those who’ve been around the block, the Learning Center also features advanced modules with a particular focus. Again, this comes along with anyone who gets registered in SAM through US Federal Contractor Registration. USFCR has a wide business network spanning many industries and regions. We help coordinate clients with needs who match your capabilities. Subcontracting is a viable way to get started in government work. Being a prime vendor isn’t the only way to make money in this sector. Actually, many people get their start by subcontracting since it’s a good way to develop Past Performance. Plus, there are plenty of instances of businesses partnering up or forming joint ventures to take on contracts. When you get registered with USFCR, you’re joining a network. As the largest third-party registration firm in the world, we’ve worked with businesses of different sizes and industries. You’ve probably bought from one of them recently or seen one of their ads on TV. If we spot a situation in which two or more clients would benefit from working with each other, we’ll get you connected. Errors in SAM.gov registration can lead to fines from the federal government. All of USFCR’s registrations are backed by a $1,000,000 insurance policy. By working through us, you eliminate any possibility of risk. Your registration is handled by a professional, so you can rest assured that it gets done right. By the way, it’s also protected by a $1 million insurance policy. Call it overkill, but we want to make sure there is absolutely no risk for our clients. When you register with USFCR, you’re buying peace of mind. This is simply because we care about your business. Firms that offer no coverage for their clients are only putting them at risk. Unlike them, USFCR is not just committed to your compliance in federal contracting, but to your success as a whole. Get access to a wide variety of federal contracting experts. We treat our clients like family and we’re personally dedicated to your success. USFCR offers a level of transparency that is unparalleled in our industry. Your venture into government contracting doesn’t have to be done alone. When you work with USFCR, it’s almost like adding an entire new department to your business, but at the fraction of the cost. In this sector, knowledge is worth more than gold, and you’ll have access to perspectives from individuals who come from a wide variety of professional backgrounds. A business is essentially a group of people working together and at USFCR, we recognize that. To us, you’re not just a client. You’re part of the family. We take the time to get to know you and your business. The best part of our job is seeing you succeed. Unlike other third-party registration firms, we offer the highest degree of transparency and accountability to our customers. That’s why anyone you need to contact can be reached from our staff page. All USFCR clients have access to a private Facebook group for networking. Opportunities for subcontracting and teaming are posted here regularly. Group members have access to live webinars every Wednesday at 2 pm EST. It’s well known that social media offers a platform of exposure and interconnectivity for businesses. That’s why USFCR has a private Masterminds group on Facebook. This group is available to all clients and it serves as a virtual space for vendors to network. Opportunities for subcontracting and teaming up are posted here on a regular basis. Plus, since all the members are USFCR clients, you have the assurance that their registrations and certifications are all up-to-date. As a member of the USFCR Masterminds group, you will also have access to our weekly live webinars. Each session covers a particular topic in federal contracting and participants are encouraged to ask questions. Masterminds webinars are hosted by Training Coordinator Anna Rose and USFCR President Dan Driscoll. They also feature special appearances from former contracting officers as well. Your Case Manager will help you with any issue that may arise with SAM.gov. They will also help make compliant changes to your registration if necessary. You will be notified for renewal months before the gov’t flags you as a risk. We’re not here to just open the door to government contracting. We’re here to help you along every step of the way. If you face any issues in compliance or have changes that need to be reflected in your registration, our team will be on standby to help. Plus, we’ll even notify you ahead of time for renewal. Many contractors are aware that their SAM registration last for a year. What a lot of them don’t know, is that SAM prefers your renewal to be 60 days early. Government agencies tend to avoid contractors whose SAM could expire early on in their performance period. We take care of the renewal process for you so it never crosses this line. Registration deters many businesses from government contracting. Get yours done as quick as possible with our services. Avoid delays or rejections that other businesses face when getting registered. USFCR has handled thousands of SAM registrations. This process is routine to us, and we’ll get yours done as quickly as possible while making sure everything is correct. You don’t have to worry about it getting rejected or running into other delays. All you need to do is provide us with the necessary information and we’ll handle the rest. The sooner you’re registered, the sooner you can start submitting offers. Some people win on their first bid and for others it takes a few tries. Beginning is the most important part of the work. If you stay committed, you will be surprised with how much you’ve learned and the skills you’ve developed in one year. We will analyze the size of your market for federal dollars set aside for your business. We will review your competition’s activity in the federal marketplace. We will examine your federal opportunities to see what’s out there for you. Right now, if you fill out the form below, we’ll give your business a free market evaluation. To start off, we’ll begin by evaluating if your business could qualify for government contracting. Then we’ll determine the size of your market within the federal space and potential opportunities that are available right now. We’ll even give you the rundown of your main competitors as well.